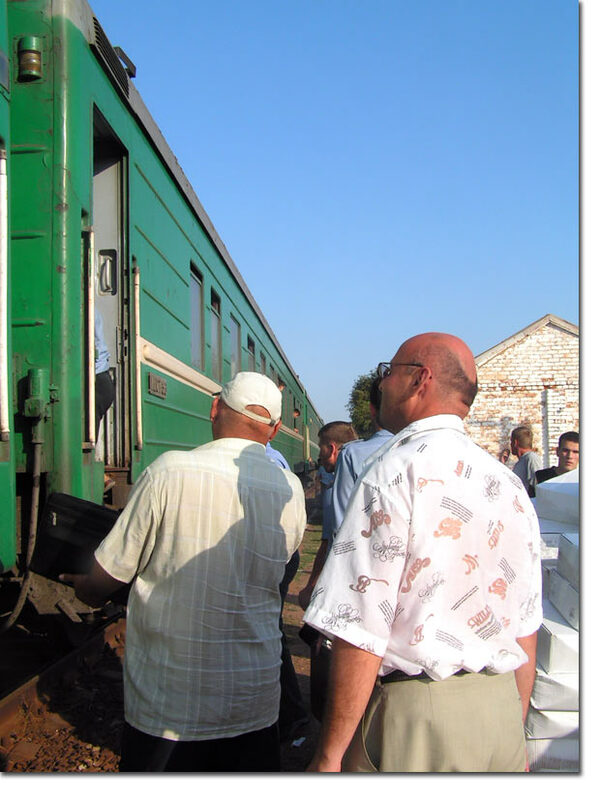 There was a time when the train from Dushanbe reached only Astrakhan, the fact that made the latter a major trans-shipment point for Central Asian immigrants on their way to Russia. Awhile ago, the route was extended to Moscow again. Made up in Dushanbe, it makes five runs to Moscow a week. 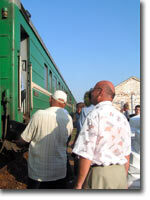 Most trains come to Moscow from Dushanbe but there are also some trains from Kulyab. The ride takes nearly four days. The train crosses four borders - with Uzbekistan, Turkmenistan, Kazakhstan, and finally Russia. This latter is crossed in the town of Aksaraisk not far from Astrakhan. So many borders make life hard for the passengers, most of them labor immigrants. Travelling to Russia and going back, passengers take as little money with them as possible - just enough for frugal meals and bribes to whoever may turn up and demand to be shown papers (border guards, customs officials, transport police, and so on). In fact, the train with labor immigrants inevitably attracts a whole bunch of extortionists. In Aksaraisk alone the cars are visited by border guards, customs officials, and transport police officers. Representatives of every structure collect 200 rubles from every passenger. Six hundred rubles per passenger, in Aksaraisk alone. As a matter of fact, conductors themselves are not above having their palms greased. Every now and then they are known to demand 100 rubles for the immigration card that is supposed to be free. (We can only hope that it does not happen too frequently.) Sum total is quite impressive, even within a single car. Do not forget the so called Ticket Mafia that has taken over railroad terminals. People who know what they are talking about maintain that an immigrant cannot buy a ticket at the booking office. All tickets are sold to intermediaries who approach immigrants and offer tickets at the nominal price plus a commission (500 to 600 rubles). Late summer is the worst season for going home. Trains depart Moscow already filled to the capacity. Labor immigrants never earn that much in the fields or wherever and therefore cannot afford to part with the commission demanded by the Ticket Mafia. Whole families with children huddle right on the platforms for days on end in the hope to eventually make it home from Aksaraisk. More often than not, these "family teams" are from the Karakalpak Autonomous Republic of Uzbekistan. In the meantime, even the coveted ticket is not yet a guarantee of an easy and unproblematic ride home. 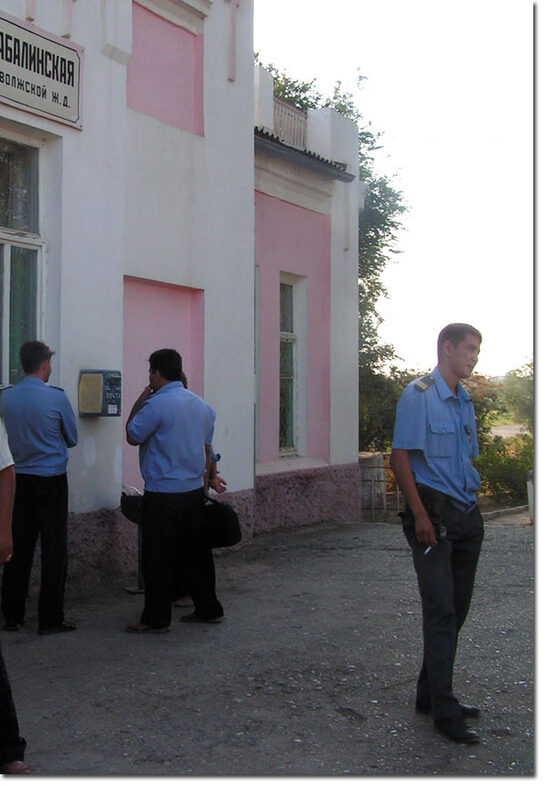 In Aksaraisk, the train rides the tracks and stops to admit passengers beyond an iron fence with the only passageway which is of course manned by extortionists in uniforms. The only way for labor immigrants is past them. The hapless passengers are bluntly told to "raise 800 rubles each or the train will leave without you." Every palm must be greased or border guards will still be "examining" the luggage when the train has already departed. (There was an episode once when the man and his child boarded the train but the wife remained behind.) There are even the rumors that the particularly obstinate passengers may end up with drugs planted in their luggage. The whole situation is enormously beneficial for all the involved structures. Absolutely everyone from ticket intermediaries to conductors to policemen to customs officials takes his turn at robbing labor immigrants. "I feel real sorry for them," a Russian conductor once said. "They make the trip in the hope to earn some money. They all have families, after all. The impression is that this is a train of lepers or something. Everyone demands his share, literally everyone..." Of course, infrequent and mostly formal investigations do occur. Some officials do lose their jobs and get replaced with new ones but... Activists of Paivand Society established by the Embassy of Tajikistan and newspaper Tojikistoni Rossiya do what they can to help with investigations but even they admit that "corruption is flourishing. An official gets sacked but his replacement is not any better." 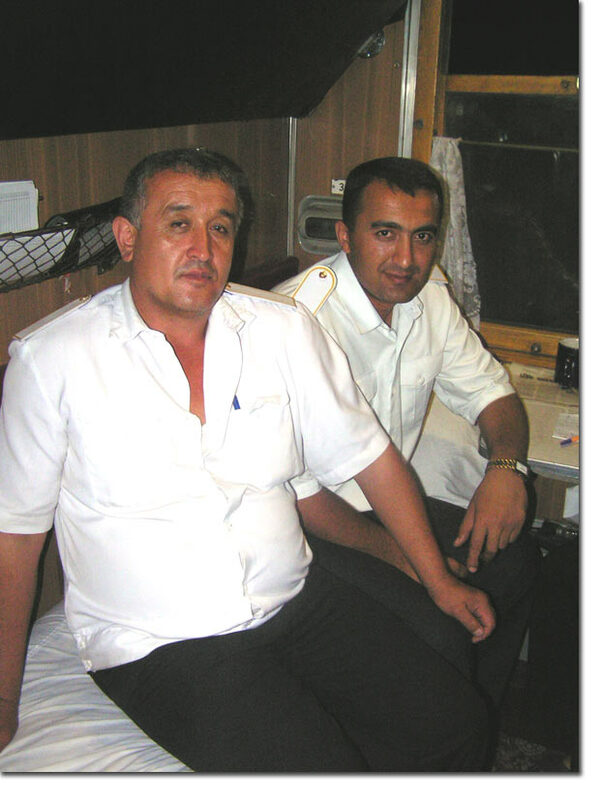 Where age groups are concerned, passengers of the Dushanbe-Moscow train represent Central Asian labor immigration in miniature. A lot of passengers are 40-45, but there are lots of 20 and 30 year-olds as well. Women are few because not everyone would take his family with him. What women are encountered are usually after 40, small-time vendors colloquially known as "shuttles". Nazri from the Kulyab region is 28. This is his third trip to Moscow. Nazri lives and works in the Moscow region near the capital itself, his Russian is nearly ideal. A student of an institute in Dushanbe once, Nazri dropped out when it turned out that the cost of studies (he was in his last year already) was more than he could afford. Nazri did not have a single acquaintance in Russia when he made his first trip here. He became a porter at the Kiev Railroad Station then. His first stay in Russia lasted 2.5 years, his second 1.5 years (he also spent some time in Kemerovo and Novokuznetsk with his uncle). Somebody asked Nazri if he had even thought of changing his vocation... He is a member of a team that is building a factory in the Schelkovo district of the Moscow region, these days. Onboard. Foreman and trainman. Photo by Ferghana.ru"
Nazri does not know how long he will spend in Russia this time. "It depends," he said. His leave of absence from Schelkovo was long (November to August) but Nazri has an excuse. He got married. "If everything is all right, I may even decide to bring my wife to Russia with me," he said. The girl is at home now, at her mother's. Nazri's "little brother" (he is 22) is also in Russia, a worker at some construction site or other in Ramenskoye. Nazri likes the way things in general are turning out. He likes Russia ("even the climate is OK"), he even got to missing this country. The team of workers he belongs to includes relatives and countrymen, living together in a hostel provided by the employer. The latter takes care of all documents from work permits to registration. Labor immigrants are getting piece-work pay. They celebrate the Navruz, New Year, and Kurban-Bairam right at the hostel. Sometimes, they even ride a commuting train to Moscow and attend the mosque on Poklonnaya Gora. Unfortunately, they cannot attend mosque every Friday but the employer (a Russian, by the way) always gives them a day-off to celebrate the Kurban-Bairam. Safe with the official registration, Nazri does not perceive any particular problems in the future. The only con is that the sick are not paid anything but whoever needs to see a doctor is always given a day-off - at his own expense. Needless to say, Nazri would dearly like to be able to work at home but it remains an unattainable dream for the time being. Nazri owns a plot of land in his native village where a house could be built. Practically all young men from Nazri's village are labor immigrants, away from homes where only women, children, and the elderly are left. Nazri's mother is content. Her two sons make sure that at least one of them is at home so as not to leave it without a man for long. In short, Nazri has succeeded in Russia. On this trip, he has even taken a friend of his who does not know a word in Russia. Nazri is going to ask his employer if he could find a job for the friend too. Only the men who have scored are more or less secure, only they can offer help to their friends. Here is a story (an infrequent one) of a labor immigrant who brought his family to Russia. labor migrant with his family. Photo by Ferghana.ru"
Kamiliddin has worked in the Samara region for eight years. He eventually bought a house and brought his family from Dushanbe. Kamiliddin with his brother and other relative comprising a team worked at all sorts of construction sites, while his wife and seven children were waiting for him at home. He is taking the family back to Dushanbe now. "It didn't work out," Kamiliddin said. "The children didn't attend school, and I never seemed able to earn enough to sustain the whole family here in Russia. They are going back, and I'll be sending them money." Boarding the train at Kharabali. Photo by Ferghana.ru"
All of that is great, if true. The immigrants, however, distrust promises, taught by their own bitter experience or scared by stories they heard. The promises nevertheless had their effect, and a lively discussion went on and on in the car - that the whole group might be dispatched to Sochi for construction of objects of the future Winter Olympics. As for Krasnodar itself, "there are lots of businesses over there. We will certainly find jobs in Krasnodar." Employers eagerly hire Tajiks because they "do not drink or smoke" but neither do they feel any pangs of conscience when they sack the workers without pay. Pay is withheld frequently indeed. One of the men in the group had spent a whole year working in Sverdlovsk and been given the boot without pay. All of that made the discussion lively indeed, both exciting first-timers and leaving them somewhat frightened. A young man from Dushanbe was particularly energetic. All his brothers already working in Russia, he had barely succeeded to persuade his parents to permit him to go to Russia too. I silently wished him luck. He needs it to live up to the parents' (and his own) expectations and come home with money. Hopefully enough to pay for his own wedding. As for the parents, they can only stay at home and wish their sons luck. Very many labor immigrants carry the tumor - a small amulet - with them. Natalia Aleksandrovna Zotova is a researcher with the Institute of Ethnology and Anthropology of the Russian Academy of Sciences. She lives in Moscow. 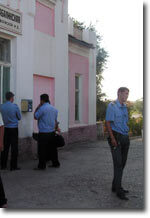 This article was written on the basis of trips to the Astrakhan and Volgograd regions in August 2006.